In this User Guide, learn how the Company Setup features enable additional forms and report of ACAManager. In preparation for completing the Company Setup section of ACAManager, be sure you have a comprehensive understanding of how the company offers benefits at a high level and whether or not they offer coverage to dependents. In addition, be sure you’ve selected a look-back period that is most suitable for tracking hours for the employees assigned to the group. It is further important to understand the employee eligibility classifications identified by the employer group and the basis for how the employer group offers coverage to each segment of its employees. 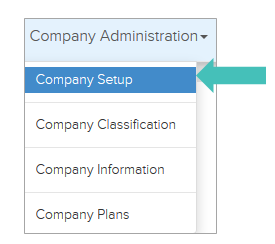 TIP: The Company Setup page has a button – Add. The purpose is to allow you to add up to three years of measure that correlate with your respect benefit plan year. Click Add to add the information for the respective plan year. In order to successfully complete the Company Setup section, you must be prepared to complete all three tabs at once. The criteria for this section will not be saved until you’ve completed all three areas and selected Save to continue. 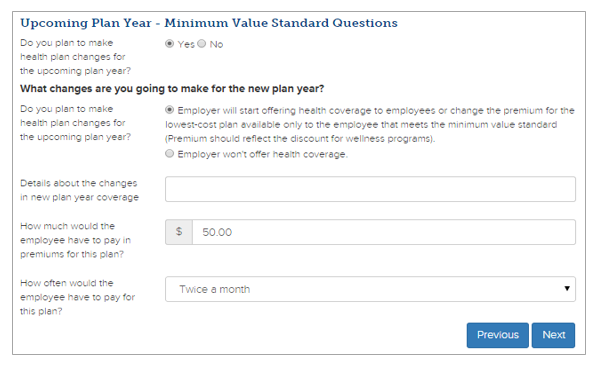 The Health Plan Eligibility tab ask you to select the plan year for which the answers to the questions apply. Be sure the year that you select from the drop down is the same as the year for which your plan year begins. For example, if you are setting up the measurement period associated with a plan year beginning during any point of the 2014 calendar year, then you will select “2014” from the drop down list. 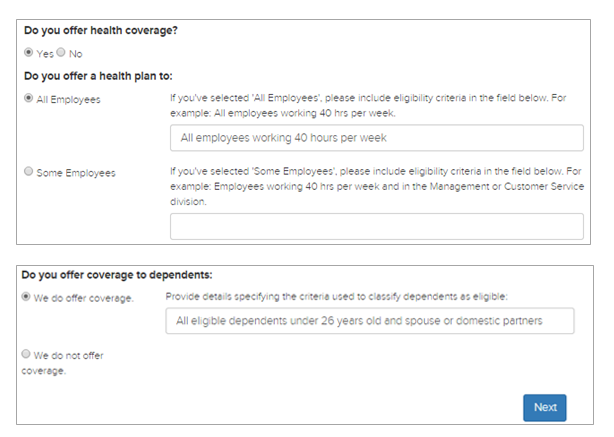 Answer the Health Plan Eligibility questions specific to how the group offers coverage – these questions ultimately are populated on the model notices that will be distributed to employees. If you select an answer that has a corresponding description area and you do not have any added details to offer, please enter N/A within that field before continuing. Click Next to go to the following tab. Respond to the questions within the ACA Plan Settings – Upcoming. The answers to these questions will be populated on the model notices. The answers for these questions, should be answered in the generic sense. We recognize the questions asked here may not have been determined as of yet, because of this, we recommend that if you do not have specifics you enter the most likely or best guess criteria. Specific employee details will be populated within the sections required. The Look-Back/Measurement, Administrative and Stability Periods tab is the final one for this section and will allow you to complete the setup for current and new hire employees. This section is used to identify the “default” look-period or the look-back period that the majority of the employees in the group will use. New hire employees will use the same duration of stability and measurement periods as the current employees belonging to the same class. All new hires will be measured on the first of the month following or coincidental with the date of hire. You will then enter the administrative period for new hires, as this is the only duration that may differ. Elect whether you would like to use a 6- or 12-month look-back/measurement period and how long of an administrative period you have/need for current employees. The next two fields identify and determine the administrative duration and start date. Although, the question that is asked is specific to the open enrollment date, we only use this naming convention to ensure that the administrative period aligns with the open enrollment period. This is important to understand, because if your open enrollment period begins for example, on 12/15/2013 we encourage you to use 12/1/2013 for the defined start date. This will not modify or change the open enrollment information within the plans housed in benefitsCONNECT®, it will however, ensure consistency in determining your measurement cycle. Once you have entered the Open Enrollment/Administrative Date you will be required to enter the administration period duration. Next, you will enter the duration and the start date of your stability period. The stability period year should mirror the year that you selected in the drop down menu upon initial setup in Company Setup. As you designate the stability period, remember that it must be greater than or equal to your measurement period. Your stability period should start on the first of the month following your administrative period, but cannot exceed 90 days following the start date of your administrative period. Once you complete the periods of measure for current employees, you will be asked to identify the number of days the administrative period will be open for new hires. Lastly, identify if the employer is paying into a union plan but does not have the plan details and expects Line 14 and 16 of the 1095-C forms to show 1H/2E respectively in which case the answer to the question is yes.